I made this drawing 2 weeks before the hand-in date for my master’s thesis. At that stressful point in the process I was trying to figure out WHAT I was doing and HOW. I also thought quite a bit about the WHY, but let’s face it: ”Why am I doing this?” is not really productive to worry about 2 weeks before something is due. Anyway, the HOW turned into this doodle and helped me do some focused work in my last two weeks as a student. I don’t know where the sheep came from (aside from the fact that I just like them). In Danish we have the expression ”Så er den ged barberet” – ”Now that goat’s been shaved! / Well, I just shaved the goat!” (Not sure how to properly translate it). 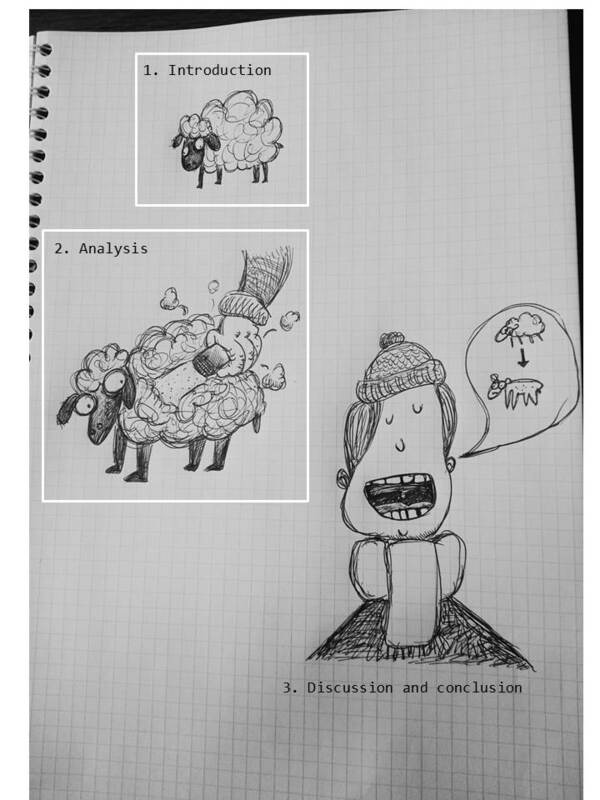 Feel free to link people to this post if you think this doodle could be helpful for them in their academic writing process, or if they like sheep. I mean not in a creepy way, just the normal amount. Oh and hey, I also used the hashtag #specialehjerne (mostly in Danish) quite a lot during my writing process, so check that out for inspiration / confusion.